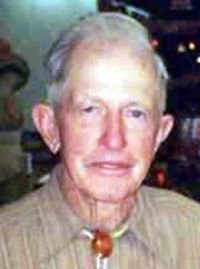 Delyle (Lyle) C. Phippen, 97, of Carey, Idaho, “graduated” from this world on Thursday, Oct. 2, 2014. He was born April 20, 1917, in Harmony, Utah, to his parents, Carl M. Phippen and Florence Kelsey, and was raised in Carey where he learned to work hard as well as enjoy the great outdoors. He grew to be very independent and was content with those things that really matter in life. He made many friends over the years, and enjoyed sharing stories about the days gone by, including his first years of formal education in a little one-room schoolhouse up near the Little Wood Reservoir. As a young man, he received his high school diploma from Carey High School, and afterwards during the Depression joined the CCC camps in northern Idaho. Delyle loved to farm, hunt game, fish and search the hillside for beautiful rocks or anything of interest nature provided. His was a lifetime pursuit to obtain a great knowledge of the world in which he lived, and he amazingly retained (and was willing to share) all that he learned. He stayed busy, believed in the law of the harvest, enjoyed growing a garden each year, and was happy to share the fruit from his trees with all who might benefit. He was a very generous person, and expressed his interest in helping the youth further their education by establishing a college scholarship fund as a memorial to his sister, Eva, which benefitted many local youths. As was his nature, Delyle, without any “fuss or fanfare,” quietly slipped from mortality, and returned to his Maker. He was preceded in death by his parents; his sister, Eva; and many of his “chums.” He is survived by a distant cousin, Ray (Carlie) Baird of Carey, and will be missed greatly by all who knew him. Graveside services were held Tuesday, Oct. 7, 2014, at the Carey Cemetery. Friends can share a condolence, story, or photo and light a candle at www.woodriverchapel.com.